Paris is known for museums, historic sites, nightlife, parks, and shopping. Your plan includes some of its best attractions: admire the masterpieces at Louvre Museum, admire the landmark architecture of Cathédrale Notre-Dame de Paris, take in the architecture and atmosphere at Basilique du Sacre-Coeur de Montmartre, and take in nature's colorful creations at Luxembourg Gardens. To find ratings, more things to do, photos, and tourist information, read our Paris trip itinerary maker tool . Maastricht, Holland to Paris is an approximately 4-hour train ride. You can also drive; or do a combination of train and flight. In April, daytime highs in Paris are 18°C, while nighttime lows are 6°C. Wrap up your sightseeing on the 22nd (Mon) to allow time to drive to Etretat. Etretat is a small coastal village on the Alabaster Coast in Normandy. Start off your visit on the 23rd (Tue): don't miss a visit to Chemin des Douaniers, take in the dramatic natural features at Porte d’Aval, and then take some stellar pictures from Falaises d'Etretat. To see maps, photos, traveler tips, and more tourist information, go to the Etretat trip itinerary builder site . You can drive from Paris to Etretat in 2.5 hours. Alternatively, you can take a bus; or take a train. In April in Etretat, expect temperatures between 15°C during the day and 7°C at night. Wrap up your sightseeing on the 23rd (Tue) to allow time to drive to Bayeux. On the 24th (Wed), admire the masterpieces at Musee de la Tapisserie de Bayeux, explore the different monuments and memorials at Bayeux War Cemetery, and then stroll the grounds of American Cemetery & Memorial. Here are some ideas for day two: contemplate in the serene atmosphere at Abbaye aux Dames, get engrossed in the history at Pegasus Memorial (Memorial Pegasus), then explore the different monuments and memorials at Hermanville War Cemetery, then explore the different monuments and memorials at Beny-sur-Mer Canadian War Cemetery, and finally take in the spiritual surroundings of Cathedrale Notre-Dame. Planning Bayeux trip won't be overwheling when you use's Insprock itinerary maker. Drive from Etretat to Bayeux in 2 hours. Alternatively, you can take a bus; or take a train. April in Bayeux sees daily highs of 17°C and lows of 5°C at night. Wrap up your sightseeing on the 25th (Thu) early enough to travel to Mont-Saint-Michel. Le Mont-Saint-Michel is an island commune in Normandy, France. Start off your visit on the 26th (Fri): don't miss a visit to Mont Saint-Michel. 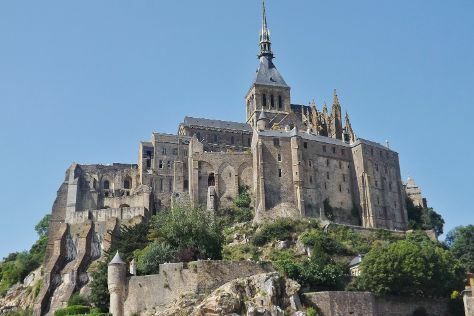 For where to stay, ratings, and more tourist information, use the Mont-Saint-Michel trip maker tool . Traveling by train from Bayeux to Mont-Saint-Michel takes 3.5 hours. In April in Mont-Saint-Michel, expect temperatures between 17°C during the day and 6°C at night. On the 26th (Fri), wrap the sightseeing up by early afternoon so you can travel to Marseille. On the 27th (Sat), take in the spiritual surroundings of Paroisse Cathédrale Saint Sauveur Aix-en-Provence, then don't miss a visit to Randonnees theatrales Marcel Pagnol Cie Dans la cour des Grands, and then contemplate in the serene atmosphere at Basilique Notre-Dame de la Garde. Here are some ideas for day two: take a memorable drive along Calanque de Port-Miou, make a trip to Chapelle Notre-Dame de la Garde, and then take in the awesome beauty at Montagne Sainte Victoire. To see photos, more things to do, other places to visit, and more tourist information, read Marseille trip planning app . Traveling by combination of train and flight from Mont-Saint-Michel to Marseille takes 8 hours. Alternatively, you can take a train; or do a combination of bus and train. Traveling from Mont-Saint-Michel in April, things will get a bit warmer in Marseille: highs are around 22°C and lows about 10°C. Finish up your sightseeing early on the 28th (Sun) so you can go by car to Saint-Raphael. Kick off your visit on the 29th (Mon): make a trip to Chapelle Notre-Dame-de-Jerusalem and then don't miss a visit to Massif de l'Esterel. Get ready for a full day of sightseeing on the next day: make a trip to Chapelle Sainte-Anne, then expand your horizons at Kelys, then examine the collection at Musee des Troupes de Marine, and finally do a tasting at Chateau Paquette. To see other places to visit, reviews, traveler tips, and other tourist information, refer to the Saint-Raphael vacation planner. Traveling by car from Marseille to Saint-Raphael takes 2 hours. Alternatively, you can take a train; or take a bus. In April, daytime highs in Saint-Raphael are 24°C, while nighttime lows are 9°C. Finish your sightseeing early on the 30th (Tue) to allow enough time to drive to Nice. Nice is known for museums, historic sites, parks, shopping, and nightlife. Your plan includes some of its best attractions: take a stroll through Vieille Ville, pause for some serene contemplation at St Nicholas Cathedral, make a trip to Place Massena, and get great views at Colline du Chateau overlook. For other places to visit, where to stay, and tourist information, you can read our Nice trip planning tool . You can drive from Saint-Raphael to Nice in 1.5 hours. Another option is to take a train. When traveling from Saint-Raphael in April, plan for slightly colder days in Nice, with highs around 20°C, while nights are somewhat warmer with lows around 13°C. Finish up your sightseeing early on the 3rd (Fri) so you can travel back home.